Cover Description: The Director watches a monitor which displays Booster in a fight with three robots. Brief Synopsis: The 1000 take the opportunity to attack Booster while he tries to save citizens from a towering inferno. Issue Notes: The events of this issue take place on a Friday night. For the first and only time in the series, the opening splash page is not a panel of action, but rather a hyperbolic depiction of the overall story in the book. Writer Dan Jurgens will later vow not to repeat it in the letter column of Booster Gold #14. Narrative balloon sets the setting as the month of August, during a notable heat wave in Metropolis. FASHION ALERT: Dirk's daughter Sarah appears on-panel for the first time, though only in a video monitor. Her kidnappers are revealed as the 1000, who are blackmailing Dirk under the threat of her life. PRODUCT PLACEMENT: The debut of a new Boostermobile. This model is blue with a yellow star on the sides and rear, the same colors as Booster's costume. The glass is tinted yellow. Even the blower emerging from the hood is painted yellow. The Boostermobile's license plate reads "BOOSTER." Trixie tells Booster that she doesn't "want to hear a thing about Goldstar until Monday!" This indicates that the day is a Friday, the final day of the common workweek. At dinner in a pizza restaurant, Booster tells Trixie his real name and hints to her that he is from the future. This is the first time that Booster has intimated his origins to anyone. Earlier, his origins were revealed to Superman, but by Skeets, not Booster. POWER UP: Booster's wrist communicator also has a video monitor, a device requiring that the reciprocating party speak into a video monitor to transmit. It just so happens that the wrist communicator is showing Skeets in his only appearance in this issue. Blue Devil's distinctive Devilmobile appears driving across a bridge over a homicide scene near the Metro Loop in Metropolis. Dialogue indicates that Wayne Tarrant is in the Devilmobile with another, unidentified person. (Dan Cassidy, perhaps?) The Devilmobile was introduced in Blue Devil #21, published in February 1986 and edited by Alan Gold, the editor of this issue of Booster Gold. Detective Stone of the Metropolis Police comments that, "it's hot enough for the Devil himself." Detective Stone references his old friend Phil Forrest, father of Rose Forrest. 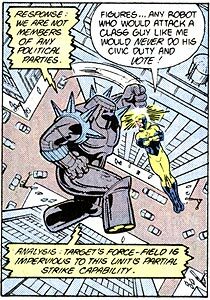 Rose Forrest is the alter ego of the Thorn and is an agent for Booster Gold. The sedan containing two homicide victims is a blue Brysler 1000 GT. The style of this fictional car appears similar to a Chrysler Corporation K-series car (such as a Dodge Aires or Plymouth Reliant) manufactured in the early 1980s. Though it is never clearly expressed, the homicide victims are assumed to be Benny and Marty, last seen alive in the closing panels of the previous issue. The Director of the 1000 reveals Doctor Shocker's name to the reader for the first time. Booster will never directly meet Shocker, but at least now we know who is planning our hero's downfall. 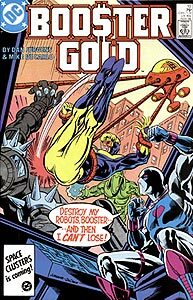 The 1000 robot assaulting Booster Gold declares Booster's strength to be "rated 8.2 on comparison scales," presumably compared to Booster's previous power levels. PRODUCT PLACEMENT: Though no advertisement is shown or brand name mentioned, Dirk mentions that Booster advertises for home fire alarms. Boosterrific Review: Events of this issue set the stage for the final story arc of the first year of Booster Gold comic books. The identity of the mysterious Director is revealed, and the stakes are raised as the Director launches his campaign to rob Booster of his powers while simultaneously drawing Booster's colleagues and friends into his revenge scheme. Adding to the growing tension are further signs of a budding romantic relationship between Booster and his secretary, Trixie Collins, which writer Dan Jurgens has been crafting slowly and credibly. If there is any flaw, it's the surprise reveal that Dirk Davis is a father, providing an entirely unexpected motivation for the character that seems more shoehorned afterthought than organic development. Despite the misstep, this issue, like any good tease, leaves us wanting more, a positive omen of things to come. Like Boosterrific said, an enjoyable issue, and I definitely agree with the comments about the Trixie relationship. It definitely seemed to follow a steady pace like something in real life. While I appreciate the dinner date between Michael and Trixie (we miss you Trixie), the battle with the robot and the whole Dirk Davis as dad angles did nothing for me. The identity of the Director surprised me when I first read these issues many years ago.